It was a bit of whirlwind weekend, one of Sean's close friends got married, so we were at the rehearsal dinner on Friday night, which was at BAR in New Haven, and I finally got to sample their famous mashed potato pizza. The wedding was on Saturday, which was beautiful and so much fun. In between those events I also went to the grand opening celebration of the Q Bridge. Anyone in the New Haven area of Connecticut knows this is a big deal. Anyone else in the world (or even in just a different part of the state) would probably think a bridge opening celebration of any magnitude would be ridiculous. The Quinnipiac Bridge, or as it is now formally been renamed, the Pearl Harbor Memorial Bridge has been under construction since 2001, the idea that it would ever actually be complete seemed so impossible. When I heard that the city was having a dedication and inviting anyone who wanted to walk across the bridge, I just felt it was something I really wanted to do. A once in a life time chance, because any other situation where I'd be on that bridge and not in a car I suspect I'd be dead. They had food trucks and music and I had an amazing grilled cheese from the Caseus Cheese Truck, got a few photos, though not with my camera because not only did I forget to charge the battery, but I also forget to take my memory card out of my computer (the fates were against me), and then I wanted to get the heck off the bridge, because it is still a highway and it was immensely hot there! Sounds like a busy but fun weekend! I love food trucks. Your yellow is so fun. Such a fun weekend!! 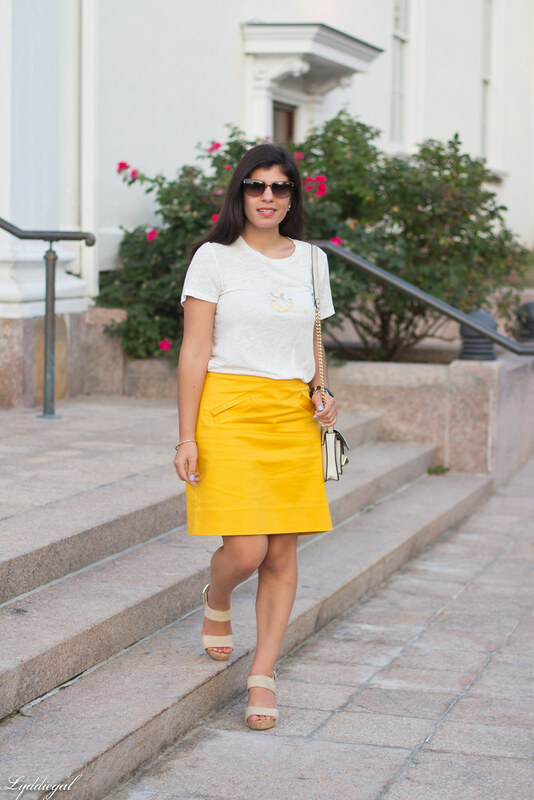 I love the color of your skirt! I am in love with the color of that skirt! It is a really great color on you too. I recently went on a trip where I forgot my memory card. I just made do with my cell phone camera. Sounds like a great weekend! 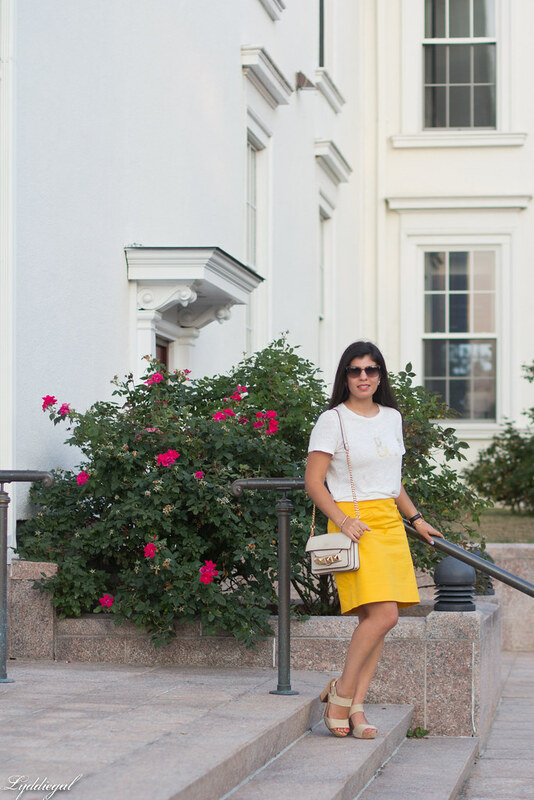 Love the yellow skirt and your bag! 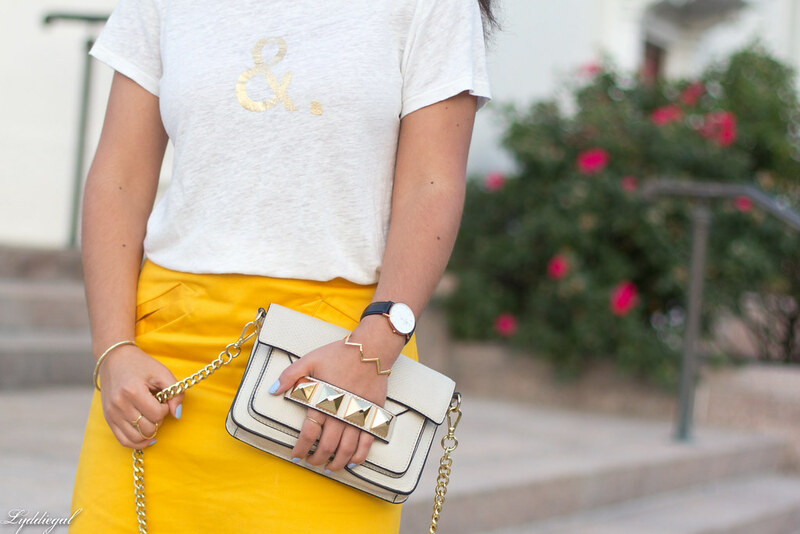 Oh wow… that skirt is perfect as is the ampersand tshirt. I saw your picture on Instagram and wondered what it was… I am a bit afraid of bridges and have had nightmares of walking on one. A few years ago I was in San Francisco and dared myself to walk the Golden Gate and I walked half of it. It shook soooo much! Mashed potato pizza?! That sounds amazing! That &. tee is super cute! 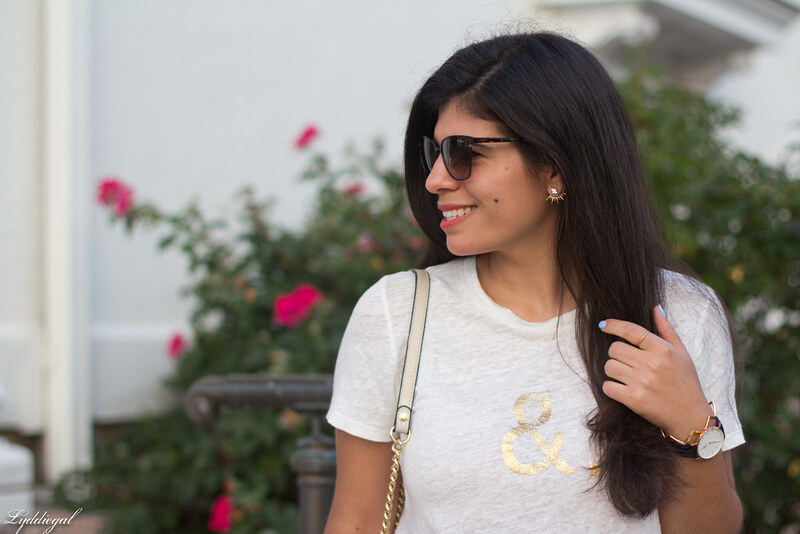 Love the fun tee! Years ago when I lived in Hawaii, they opened a new freeway and they opened it to the public for walking before letting cars on it. I don't remember attending but wished I did. This sounds like a fun event! 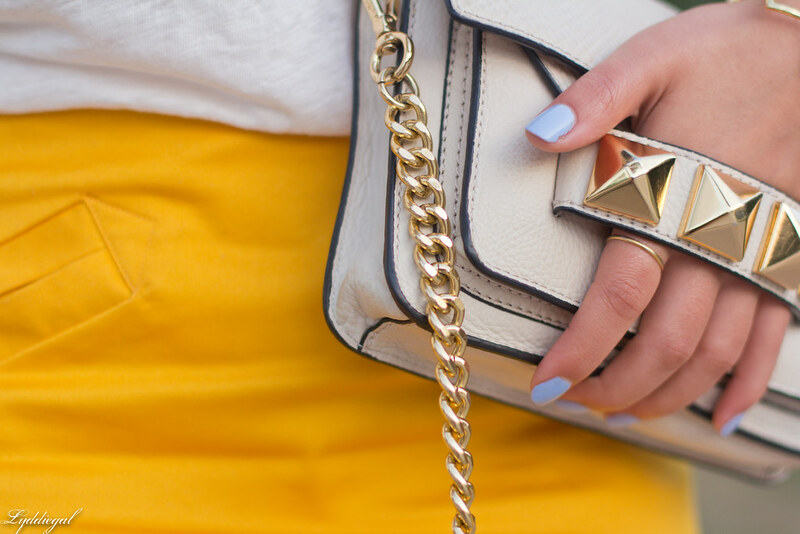 sounds like a fun weekend, and yellow is so pretty on you. Mashed potato pizza? Sign me up for that :) Love that tee! 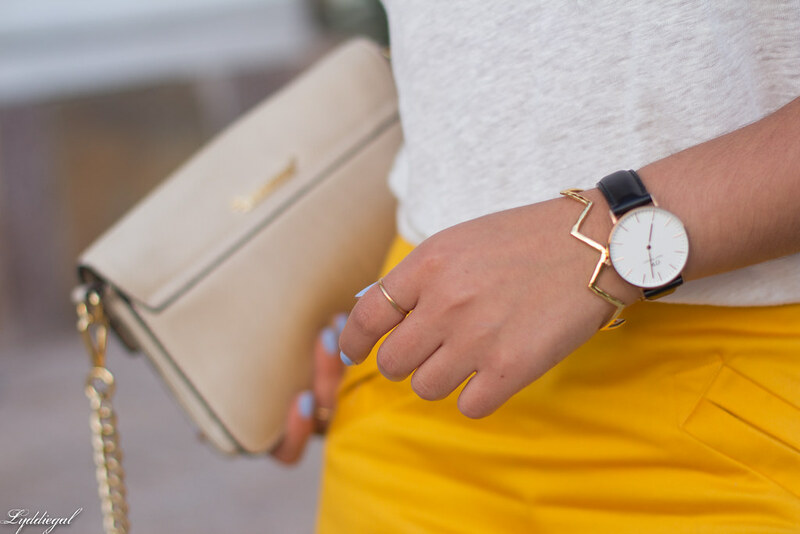 Love the entire ensemble, head to toe! That yellow looks great on you! Sounds like a fun, busy weekend! (And both the mashed potato pizza and grilled cheese sound delicious!!) 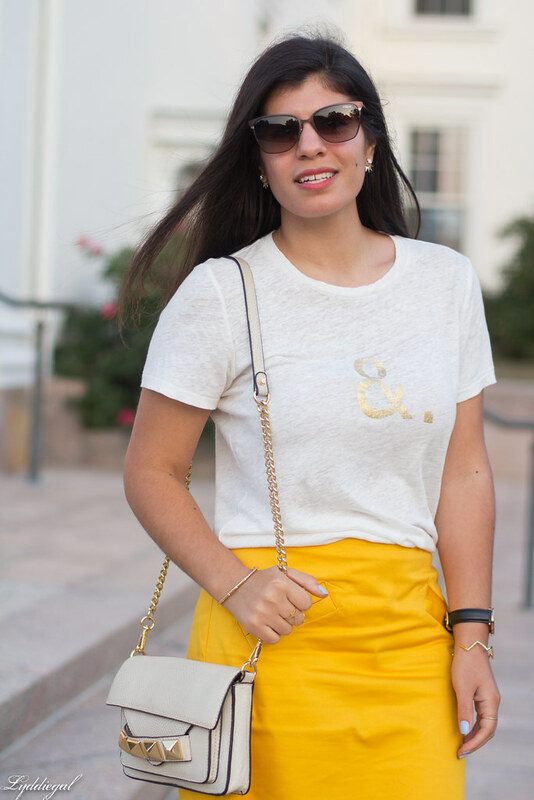 Love this look with the bright skirt and ampersand tee! The chance to be one of the first people to cross a new bridge - especially one that has been under construction for such an unfathomably long time! - actually sounds pretty amazing. But then again, I crossed the Brooklyn Bridge for the first time last week and in reality it was actually totally terrifying with all the cars roaring by underneath but still, amazing too. (No grilled cheese, though, and I'm sure that would have enhanced the experience ;)) Love this still summer look on you. Yellow works so well for you!